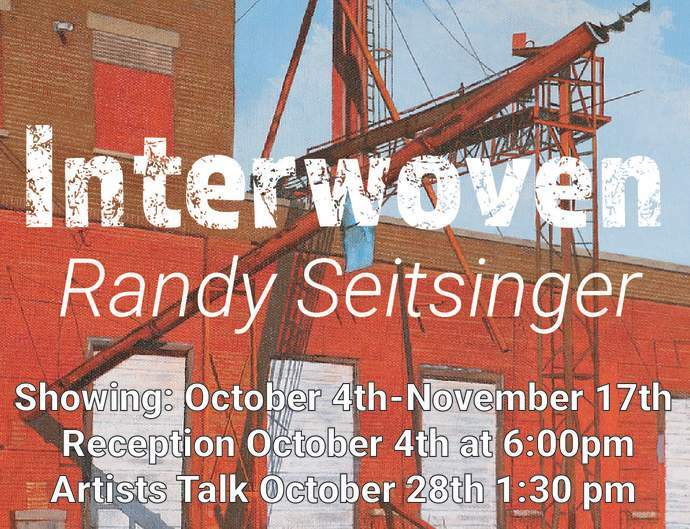 (STILLWATER, Oklahoma / September 27, 2018) - Modella Gallery is pleased to present the Interwoven exhibit, which displays work by the artist Randy Seitsinger. The exhibition runs from October 4 – November 17, 2018, with the opening reception from 6-8pm Thursday, October 4. Seitsinger explores the everyday condition of Oklahoma, and the essence of the hidden beauty of conventionally ugly places through impressive perceptual painting and drawing. Seitsinger received his undergraduate and graduate architecture degrees at Oklahoma State University and worked as an architect in New York City and Chicago before returning to Stillwater in 1987 to join the OSU School of Architecture faculty. He served as Head of the School of Architecture from 1995-2016 and has served as Associate Dean of Academic Affairs in the College of Engineering, Architecture, and Technology since 2016. Seitsinger has been painting since undergraduate school and takes inspiration from his extensive traveling, and from Oklahoma. Seitsinger’s paintings, drawings, and photographs have been displayed in the OSU SOA Gallery, the Design Communication Conference exhibition, and the Design Communication Association national conference multiple times. Additionally his work has been featured in the Malinda Berry Fischer Gallery, the Town and Gown Community Theater, and The AIA Central Oklahoma Gallery. Modella Gallery is located at 721 South Main Street in historic downtown Stillwater, OK. Hours are Thursday and Friday 5-8p; Saturday 11a-5pm, and Sunday 11a-3pm. For further information, please contact the gallery at (405) 880-4434 or visit modellaartgallery.org.